Fresh (or stale) from his encounters with Freud (The Seven-Per- Cent Solution, 1974) and Jack the Ripper (The West End Horror, 1976), Sherlock Holmes comes up against the Phantom of the Opera, with mixed results. Disguised as a Norwegian violinist who replaces a performer at the Paris Opera who's been frightened off by the Phantom, Holmes is blackmailed by the woman, Irene Adler, into contracting to protect soprano Christine Daa‚ (who's so innocent that she believes the mysterious singing master who calls himself ``Nobody'' is the Angel of Music) from her ghostly patron. At first the Phantom seems intent on terrorizing everyone but La Daa‚: her replacement as Faust's Marguerite, the oblivious incoming directors, even the new woman who tends the Grand Tier left boxes. No sooner has Holmes guessed at the Phantom's identity, though, than he spirits La Daa‚ off to the cavernous Opera basement for the requisite--and anticlimactic--finale. 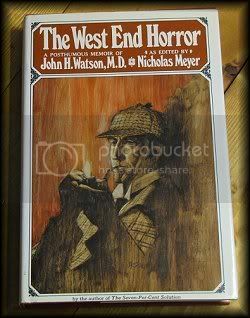 Should appeal to those fans (and there will be plenty) who can overlook the undistinguished stylistic pastiche--Holmes rather unwisely narrates this lost adventure himself--the footnotes that explain every last Holmesian reference, and the unfortunate poverty of the plot. This book began a tad slow for me. Watson asks Holmes to tell him some things that happened to him when he was "presumed dead". Having a chance to begin life over Holmes goes to Paris and manages to get a job playing violin in the opera orchestra under an assumed name. The book picks up it's pace as it goes along and of course eventually turns into one where you just keep reading until you know all the answers! There are shades of Dickens underworld here in Paris and at times almost forgot this took place in Paris not England! It was a tad different from most Holmes stories in that it was only Sherlock on the adventure, as he told his close friend Watson, a few times, he wished he was their to help him. It was very enjoyable. I think I liked this one better than the West End Horror. I can see why people asked Meyer to continue writing about Sherlock.. I think he had an excellent ability to do so. If you like reading Sherlock Holmes I do believe you would like this book. Now, I wouldn't mind running across an old copy of Seven Percent Solution by Nicholas Meyer! Becky reviewed this book and I knew at once I had to read it. Almost Astronauts by Tanya Lee Stone. “Space gals. Astronettes. Astrodolls . . . Who do these women think they are?” The media mocked them. Male astronauts did not want them, and neither did then vice-president Lyndon Johnson. 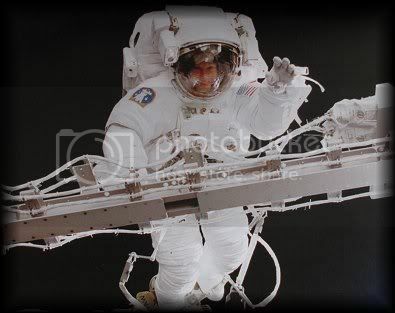 If they were to let women into the space program, blacks and other minorities would be next. 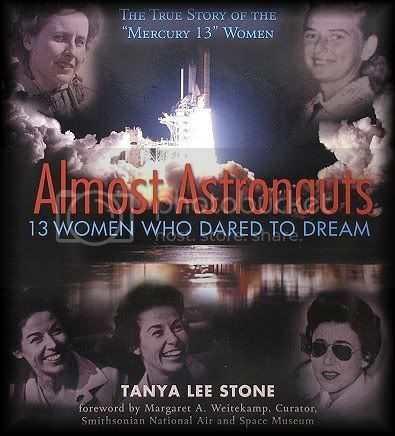 Nearly 20 years before the U.S. officially admitted women into the astronaut program, 13 women, known as the Mercury 13, fought for the right to soar into space. This dramatic, large-size photo-essay covers their stories, along with the exciting politics of the women’s liberation struggle in the 1950s and ’60s (“What is a woman’s place?”) and the breakthrough science and technology surrounding space exploration, including details of the would-be astronauts’ tests and training. The chatty, immediate style (“Picture this”) and full-page photos make for a fast read, and the crucial civil-rights history will stay with readers. The long, spacious back matter is part of the story, with detailed chapter notes and a bibliography. Of course, before you even begin to read this you know the final outcome, that indeed there are female astronauts and even female captains of shuttle flights. As I read Becky's review I remembered some of the struggle for woman to be able to go into space. ...and wouldn't you know that the reason I remembered some of it is because Nichelle Nichols (Uhura: Star Trek) was in the mix of things going around encouraging females and females of all colors to enlist to be an Astronaut if this was a longing they had to do. I wondered as I read this book if that would be mentioned and although it was only one line... it WAS mentioned! I very much enjoyed reading about the hardships they went through back in the early days of the space race. I did not know that when President Johnson took over the office that he was so against woman in space because then he would have to allow "other minorities". That alone surprised me so much I began to wonder why Kennedy picked him for a running mate! 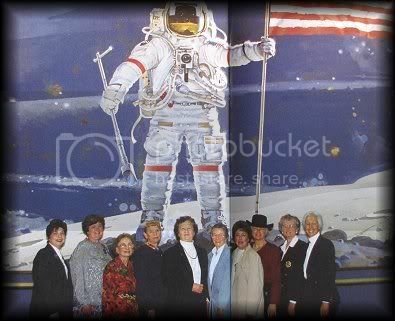 I admire these woman for not giving up and making a difference so that "eventually" woman did get into space. Now, I am not a get on the soap box person with all the equal rights stuff (not saying I don't believe it.. I am just not a big speaker on it)... but I have always believed that if the person can do the job and do it well then they deserve the job no matter male or female, white, yellow or black or what religion... as long as they can do the job and do it well, be it going into space or being a garbage man (person) they deserve the job dang it! Anyway... thank you Becky for bringing this little book to my attention! I am very glad I read it!!! Selling two million copies in earlier editions, this is the second of the rediscovered Sherlock Holmes adventures. "Acquired" from a widow whose husband was descended from the distaff side of Holmes's family, this mystery finds Holmes solving a double murder in London's theater district. 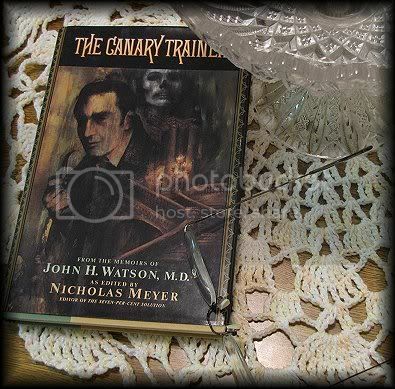 I have both is book and The Canary Trainer by Nicholas Meyer (I will read the Canary Trainer next) He begins both books with the letter from a widow claiming to be a relation and having some stories that have never been published for sale... Nicholas purchased them. This is actually a small book and a short 224 pages, so don't ask why it took me so long to read it because I don't know why other than I can't get out of this slump I am in. But I did quite enjoy this book. I love Nicholas Meyer both as a writer and director, and for the life of me I can't read anything Sherlock (like the Mary Russell books) without hearing Basil Rathbone's voice in my head! I know many people like others who portrayed Sherlock but Rathbone was who I grew up on so no matter how many others did him in movies his voice will always remain Rathbones! This was a good mystery! Some familiar names bounced around, like Oscar Wilde, Bernard Shaw and even Bram Stoker! I like when I recognize names in a book. It would be hard to talk about the mere 224 pages without giving anything away so I can't really say much... but if you have enjoyed other Sherlock stories I have no doubt you will like this one as well. Naturally it's a murder mystery (actually 2 murders) with a twist to the ending. I would have liked a little more description of the different areas they were in England but that's probably because I've never been there and love seeing them in my mind. 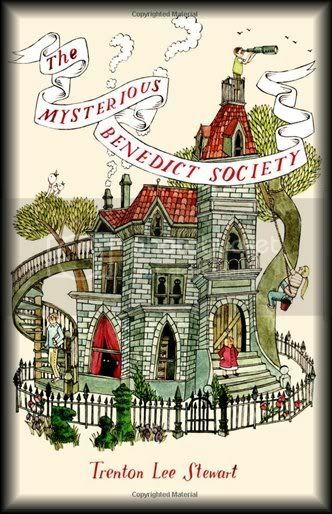 So.... if you like Sherlock and never heard of this book...it might be one of interest to you! 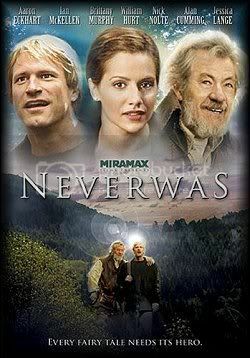 A few days ago I caught the last 30 minutes of this movie.. "Neverwas", ever hear of it? Well I hadn't! 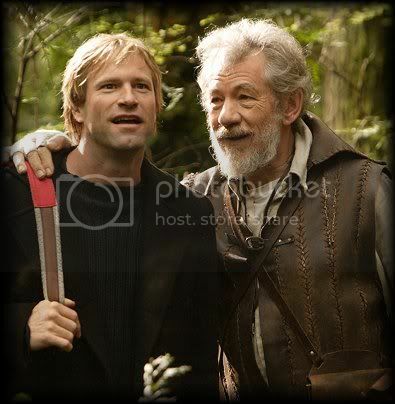 Get a load of this cast: Aaron Eckhart, Ian McKellen, Brittany Murphy, Nick Nolte, T.L Pierson, Jessica Lange, and William Hurt.. so how come I haven't heard of this movie???!! Probably because it didn't get very good ratings... but just because Ian was in the movie I watched what little of the movie there was left and then ordered the dvd! Yeah, I know.. dumb dumb dumb..but I do love Ian! Zach Riley (Aaron Eckhart) is a psychiatrist, who leaves a job at a prestigious university, to take up a job at the privately run mental institution, 'Millwood', belonging to Dr. Reed (William Hurt). What he doesnt reveal at the time of his appointment is that this was the very place where his novelist father, T.L. Pierson (Nick Nolte), spent many years of his life, and later wrote a popular childrens classic, Neverwas. I have to tell you.. even though I didn't see a lot of this movie, and even though it didn't get good ratings and even though it's a movie without a lot of "special effects", I did see one thing... Ian McKellen creating magic! I swear this man can do no wrong when it comes to acting!.. I like him well before he became Gandalf and he just keeps getting better with age! So,... I will now wait until I can watch Ian once again..but he's worth the wait! This book is a combination of two books that Ms Wrede has written: Mairelon the Magician and Magician's Ward. I will post them as two individual posts. No, not a hospital drama about ailing wizards, but another yarn set in a fantasy Regency England featuring Richard Merrill, a.k.a. Mairelon the Magician, and his ward Kim, the former street thief. While Kim resists Richard's Aunt Agatha's determined attempts to introduce her to Polite Society (i.e., find her a husband), a gentleman burglar attempts to steal a book from the house library. Somehow connected to this, so Kim learns from an old thief colleague, are the efforts of a wicked moneylender to gather up street urchins who have magic talents, coupled with a mysterious, debilitating magical attack on Mairelon himself. 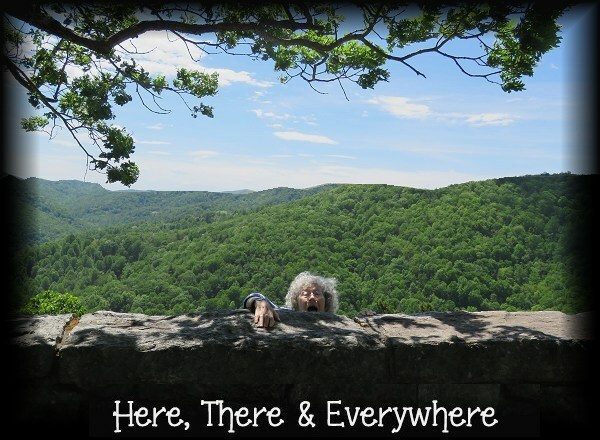 I don't know if it's the writing.. the stories .. or what it is that makes me find Patricia C Wrede's books so enjoyable! Maybe I am British at heart?! I know I am half English and half Irish.. I dunno maybe that's it! The second book in Magic and Malice was very enjoyable! Though I felt a little sorry for Kim through much of the book as Mairelon's mother came to live with them and immediately took over dressing and introducing Kim into society to find her a husband ! Now this may have been very typical in old England but the twist (isn't there always a twist?) was of course that they would except her even though she was a one time thief because she was being "introduced" as a magician which held much esteem. It helped that it turned into a bit of a mystery to be solved . Of course this turned into many events before anything close to a conclusion was found. I loved her other books about Sorcery and Cecilia and I enjoyed these two books! I guess one might say I've become a fan of Patricia Wrede's writing! If you've read her other series this read will not disappoint! I am surprised that she never used Mairelon and Kim in other mysteries! Oh, and one last thing about a minor character.. Aunt Agatha . When you first meet here she is a tad annoying trying to rule Kim's life.. then she sort of falls away into the background when Mairelon's mother arrives.. but then near the very end she makes another appearance and you really like her! I really saw potential for these characters to go on to more adventures and I'm sorry they didn't. If you wish to read this book as a hardback you will have to find a used copy. The book is a combination of two books that Ms Wrede has written: Mairelon the Magician and Magician's Ward. I will post them as two individual posts. 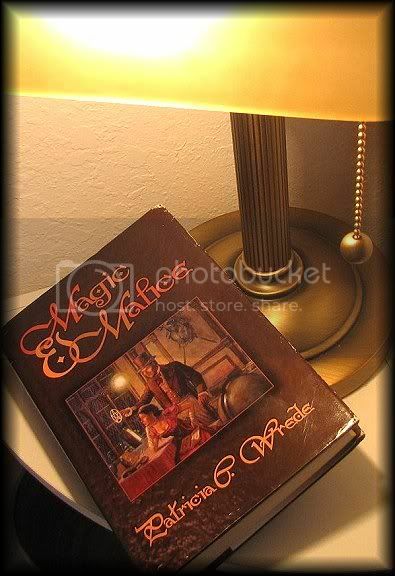 I just finished reading the first part of the book: Mairelon the Magician. YA-- This historical fantasy borrows many of the conventions of the historical romance to create a frothy tale that should appeal to a broader audience than would a straightforward fantasy, romance, or historical novel. Kim is surviving the streets of some London in never-never land by disguising herself as a boy and working at the least objectionable and illegal tasks offered to her. She knows that her age is bringing her masquerade to an end, so when fortune throws the mysterious, but apparently honorable, Mairelon in her path with the offer of a job and a destination, she takes the opportunity. From this point, the plot plunges headlong into a convoluted story involving magic, disguised noblemen, sacred vessels, and a ``put all the subjects in the same room and we'll solve this mystery'' conclusion. Trying to stay one guess ahead of Kim and one behind the dashing Mairelon will keep the pages turning. Although Kim is a somewhat vague conception, Mairelon qualifies as a fully realized romantic hero. I quite enjoyed the first of the two books joined in this hardback version. I have read other books by Patricia C Wrede and enjoyed them so when I found this older book I thought I'd give it a go. As it turns out it's a bit of a mystery surrounded by magicians and magical artifacts , truths and lies... not a bad combination. I did have a little difficulty though (not enough to make me put it down lol).. first off I found it had a bit many characters to try to remember them all and how they connected or didn't connect.. but I plowed on.. But no matter, I found quickly that if I kept reading I got the idea of what was being said, and although at times I thought I was reading a foreign language.. oh wait.. I was! heh. I did enjoy the story very much. Mairelon the magician was a pretty neat character of which you don't learn "all" about him until the very end! Kim, the young girl thief passing herself off as a boy was interesting too.. once again you find out some surprises at the end about Kim too! Amazons review is quite good although I'm not sure I would list Mairelon as a "romantic hero"??.. guess you should read it for yourself and find out ! By the skin of my teeth I finished this book on the last day of January!!! I have been in a reading slump, but it wasn't because of the book I was reading! This is a very enjoyable book and excellent writing I might add! The author does not write down to YA readers. (nor is it too difficult) I'd give A+ for the great writing. The group of four children, Reynie, Kate , Constance and Sticky made a great team and the book isn't without it's surprises at the very end. No one is without their drawbacks, be it being an Orphan, a runaway or laughter making Mr Benedict fall asleep! Quite Original, or I just haven't read anything like it ! There are already 2 more books out following this one but for now they will have to wait. Book one could be read as a stand alone book should one decide not to read on. I have not heard any reviews of book 2 or 3 but if they are as good as book one I doubt you would be disappointed. I will do the January Wrap (big joke) tomorrow.